(Great) strength of a group of stones. 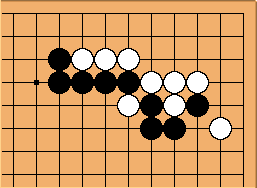 Comparison of strength of all the black versus the white stones on the board. General playing style of a player preferring strong stones. Playing style of a player preferring strong stones in a particular game. The quality or property of being thick. The meaning (2) is related to attack and sense of development. Attack in particular is crucial to using thickness, because (in this sense) thick positions are defined as relatively strong stones. Treated only as a wall to immediately enclose territory, that strength goes unused, and the result is overconcentrated. Therefore the main quality of thickness is that it changes fighting possibilities. The immediate potential for territory is often secondary. In either case the full value of a thick shape is not converted simply by any territory made locally. The opponent may need extra moves to achieve an equally alive and connected shape. Detailed definitions are in the book Joseki 2 Strategy, which is published in 2011, on pages 77 (informal model) and 90 (theoretical model). Previously only specific kinds or aspects of thickness were considered: For example, a strong formation of stones, typically exerting outward influence (in Japanese: Atsumi) or an overall lack of defects, (in Japanese: /Atsusa). There is a greater variety of types though because each of the three aspects of thickness can vary in its degree. While it has long been evident that thickness is inextricably linked with other high level abstract concepts, the English go literature almost always begins by declaring the simple meaning (1). It may then go on to try to explain the implications of meaning (2) and state the key proverb play away from thickness in some form, or not. Nearly all occurrences of thickness in the English go literature have the first meaning, such as, "this or that was made thick" leaving the abstract implications optional to the reader. In meaning (2), the group would be considered thick in proportion to the usefulness of these features. For example, having an additional eye over adjacent groups may be highly prized. Or if close fighting is expected, number of liberties may be key. Of course having two eyes essentially renders the group invulnerable to attack, hence pass-alive is, in this meaning, the ultimate form of thickness. From the 3-5 joseki. Black's thickness is large, with good eye potential. 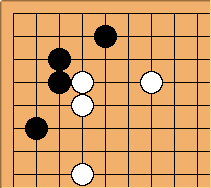 In the above diagram, Black's shape is difficult to attack. The white stone will be captured, and there is no local play that would really threaten black's status as a living group. White isn't typically considered thick here because thickness is usually thought of as strength that is facing outward. White is definitely alive, but his strength has little effect on the rest of the board. 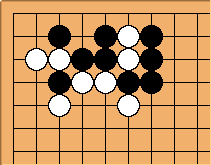 The principle characteristic of White's formation is that it makes territory, while the principle characteristic of Black's formation is that it radiates influence, which it does because of its strength (thickness). From the 3-3 joseki. White's thickness is not as strong, with less eye potential. From the 3-4 joseki. Black has territory with thickness, radiating influence along the top side.